Tonight January 28th, 2014 at the United States of America's State of the Union "seated with the First Lady is Sgt. 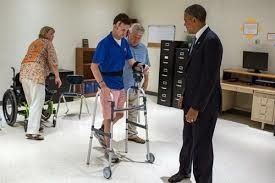 1st Class Cory Remsburg, a wounded Army Ranger who has met President Obama three times: once before he was wounded while participating in a D-Day reenactment in Normandy, France, and twice after his injury, at National Naval Medical Center, Bethesda, Md., and in Arizona during physical rehabilitation. Did anyone notice the very long applause for Cory Remsburg. We appreciate Cory very much, but he would probably have traded all the applause for his health. 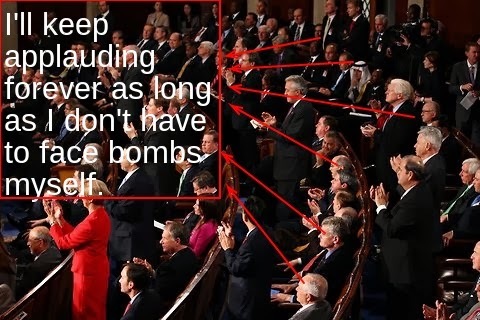 Why do we applaud those that are killed and bombed and not speak about reducing and eliminating war and weapons?